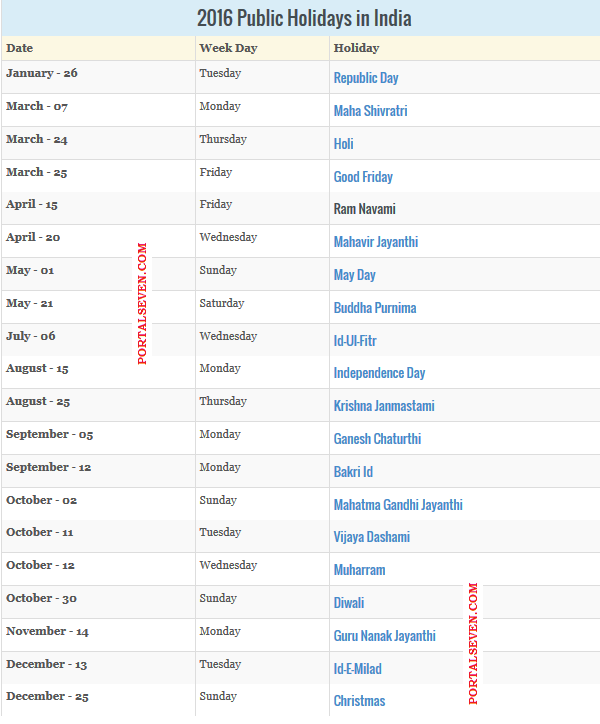 Check the complete list of 2016 National, Restricted and State holidays in India. 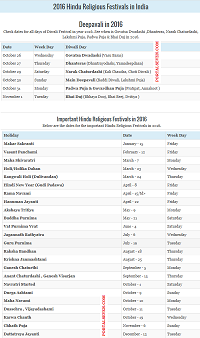 Also check important Hindu and Muslim festival dates along with Diwali(Deepavali) calendar for 2016. 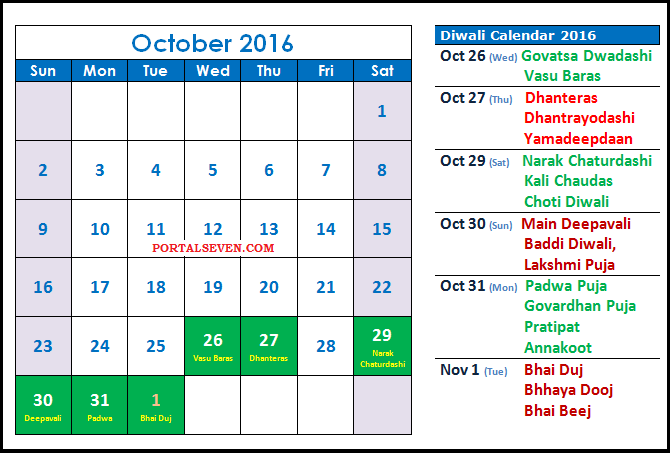 Check dates for all days of Diwali Festival in year 2016. 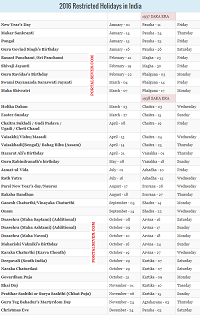 See when is Govatsa Dwadashi ,Dhanteras, Narak Chaturdashi, Lakshmi Puja, Padwa Puja & Bhai Duj in 2016. 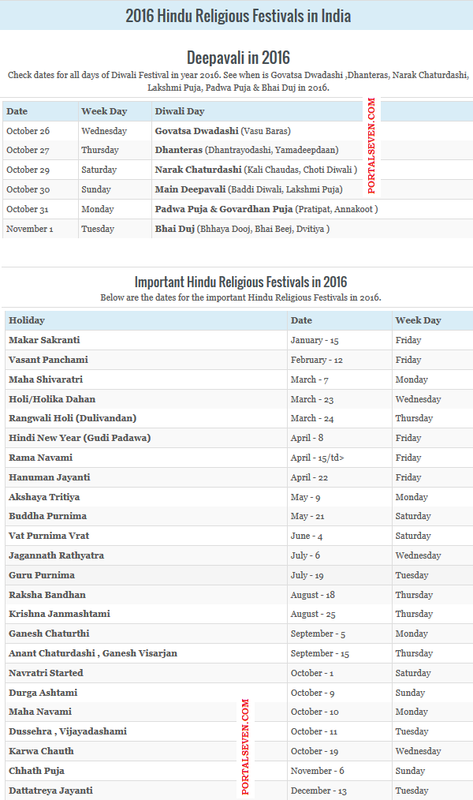 Below are the dates for the important Hindu Religious Festivals in 2016. 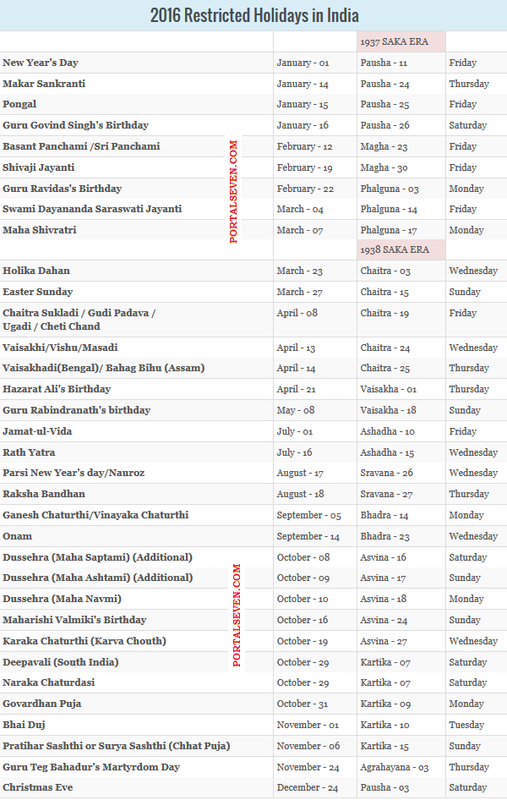 Check the dates for the Muslim Religious Festivals in 2016. Maha Shivratri, the night of the worship of Lord Shiva, occurs on the 14th night of the new moon during the dark half of the month of Phalguna. It falls on a moonless February night, when Hindus offer special prayer to the lord of destruction. Holi, also known as Dhuli Vandana in Sanskrit,also Dhulheti, Dhulandi or Dhulendi, is celebrated by people throwing coloured powder and coloured water at each other. 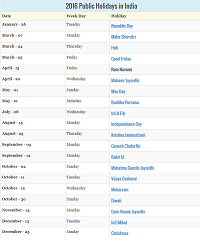 In Jainism, Mahavir Jayanti is the most important religious holiday. It celebrates the birth of Mahavira, the last Tirthankara. He was born on the 13th day of the rising moon of Chaitra, in either 599 BC or 615 BC (depending on religious tradition). Good Friday, also known as Holy Friday, Black Friday, Great Friday, is a religious holiday observed primarily by Christians commemorating the crucifixion of Jesus Christ and his death at Calvary. 'May Day' is commemorated in India as the 'Labour Day' which began with the United States Labour Movement on May 1, 1886. Buddha Jayanti or also known as Buddha Purnima is the most sacred festivals of Buddhist. Buddha Purnima (Buddha Birthday) is celebrated in remembrance Lord Buddha. Lord Buddha is the founder of Buddhism. This day is the birth anniversary of Lord Buddha. Krishna Janmashtami , also known as "Krishnashtami","Saatam Aatham" ,"Gokulashtami", "Ashtami Rohini", "Srikrishna Jayanti", "Sree Jayanthi" or sometimes merely as "Janmashtami", is a Hindu festival celebrating the birth of Lord Krishna, an avatar of the Hindu deity Vishnu. Eid al-Fitr often abbreviated to Eid, is a Muslim holiday that marks the end of Ramadan, the Islamic holy month of fasting (sawm).The holiday symbolizes the breaking of the fasting period. Ganesha Chaturthi , also known as Vinayaka Chaturthi, is the Hindu festival of Ganesha. It is the birthday of Lord Ganesha who is widely worshiped as the god of wisdom, prosperity and good fortune. Gandhi Jayanti is a national holiday celebrated in India to mark the occasion of the birthday of Mahatma Gandhi, the "Father of the Nation". It is celebrated on October 2, every year. It is one of the three official declared National Holidays of India and is observed in all its states and union territories. Vijayadashami is a festival celebrated in varying forms across Nepal and India. It is celebrated on the tenth day of the bright fortnight (Shukla Paksha) of the Hindu autumn month of Ashvin or Ashwayuja, and is the grand culmination of the 10-day annual Navaratri festival. Vijayadashami is also known as Dasara, Dashahara, Navaratri, and Durgotsav. It is celebrated in the lunar month of Ashwin from the Shukla Paksha Pratipada to the Dashami, or the tenth day of Ashwin. Guru Nanak Jayanti is the birthday of the first Sikh Guru, Guru Nanak, and one of the most sacred festivals in Sikhism. Guru Nanak Dev Ji (the First Guru, the founder of Sikhism) was born on 14 April 1469 in Rai-Bhoi-di Talwandi in the present Shekhupura District of Pakistan, now Nankana Sahib. Christmas or Christmas Day is a holiday observed mostly on December 25 to commemorate the birth of Jesus, the central figure of Christianity.